01/07 This title is now available from Walter de Gruyter. Please see www.degruyter.com for more information. The field of mathematical statistics called robustness statistics deals with the stability of statistical inference under variations of accepted distribution models. Although robust statistics involves mathematically highly defined tools, robust methods exhibit a satisfactory behaviour in small samples, thus being quite useful in applications. 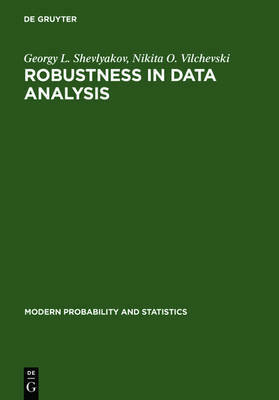 This volume in the book series Modern Probability and Statistics addresses various topics in the field of robust statistics and data analysis, such as: a probability-free approach in data analysis; minimax variance estimators of location, scale, regression, autoregression and correlation; L1-norm methods; adaptive, data reduction, bivariate boxplot, and multivariate outlier detection algorithms; applications in reliability, detection of signals, and analysis of the sudden cardiac death risk factors. The book contains new results related to robustness and data analysis technologies, including both theoretical aspects and practical needs of data processing, which have been relatively inaccessible as they were originally only published in Russian. This book will be of value and interest to researchers in mathematical statistics as well as to those using statistical methods.